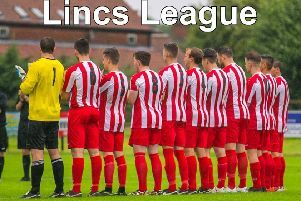 Skegness United missed out on a place in the Challenge Cup final following an excellent match against Kirton Town. Both sides gave 100 per cent commitment in this semi-final clash. United were missing their two leading goal scorers, Ryan O’Loughlin and John Courtney. Also unavailable was Alex Kendrick, however Ross Muirhead returned for his first game since November. The game began as an even affair with both sides looking to attack, with former United player Lee Orrey and Richard Barker looking dangerous for Kirton. For United, Kurt Crossley and Michael Hardy, in midfield, were always involved the action. After 20 minutes it was the visitors who took the lead when a loose ball in the United box was not cleared and it was slotted home. Five minutes later United drew level when, after a flowing attacking move, the ball arrived at the feet of Keaton Grainger, who fired into the far corner past Ryan Motley in the Kirton goal. At this stage of the game United began to take control, however they had to be alert to the visitors’ counter attacks. With half time approaching United took the lead. Following a well-placed free kick the ball was headed on by Jamie Lyall for Hardy to head home at the far post. United went in at half-time with a deserved lead, andfelt they did not want the half to end. Kirton came out in the second half looking quickly to get back on level terms. This arrived when a misplaced ball on the edge of the United area was picked up by Richard Barker, who fired into the corner of the net, leaving Jack Minor with no chance. This appeared to give confidence to the visitors, although United were still seeing plenty of the ball. However, they could not find the final pass to open up the Kirton defence. With 20 minutes to go Kirton got the winning goal following a bizarre decision by the referee to awarded a free kick to the visitors on the edge of the United area. From the resulting kick the ball was played to the far post where Kirton’s captain Sam Wright headed home. United continued to press forward in the final 15 minutes but the final ball either flashed across the goal or wide of the target. As the final whistle blew, Kirton deserved their victory based on their second half display, and taking their chances when they were presented. UNITED: J. Minor, Muirhead, Lyall, Pearce, Wager, Sleight, Bray (Drysdale), Crossley (Wilkes), Dennis, Hardy, Grainger; Sub (not used): Howitt.